Pam was also a participant in a government funded self build housing scheme. She to had strict limits for spending on a block and then to construct a house. If the truth be known even my closest friends and family were surprised. And that gives me confidence to do other things I didn't think I could"
The reasons given by Pam for wanting to build her own home were; the environment, security, age and independence. In terms of her age Pam said "renting is very difficult on a pension". Pam wanted to set herself up before this became a problem. Home purchase was not an option for Pam as she was a single woman on a low income. Again she felt her age was a factor, being 49 years old she may not have represented a good risk as a mortgagee. Self build seemed to Pam to be a cheaper option than buying an existing home and she has achieved a 45% equity in her home by contributing her labour and meeting repayments. She too continues to live in the same house. Becoming a self builder has had some influence on Pam's income in that it limited her to part time work. Pam said that she applied for the scheme when she heard about it in about 1987. She started the paperwork and site hunting at the end of 1988 and by April 1989 was starting construction. Construction ended in July 1991. There were several key issues in timing for Pam, these were; weather, work, and housing authority deadlines. As a single person Pam was supposed to have her house complete within 18 months. Pam said the whole process took longer than she expected. "Construction was delayed initially because it was too wet to clear trees and excavate. I used the soil from the excavation for the mud bricks." 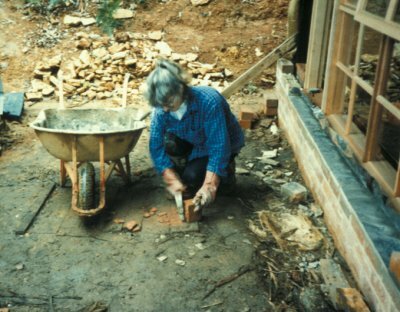 Delays were also due to the fact that Pam had to sieve all the soil for the mud bricks when it was found to be full of rocks and that the damp weather slowed the mud bricks drying process. Pam said she was "making mud bricks in the rain in a wet winter", little wonder they were slow to dry. 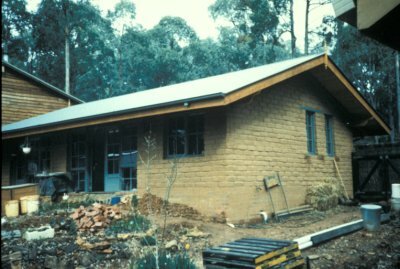 Watching the house actually grow was great and seeing the rows of mudbricks drying was good. These are the easiest to remember. Having to sieve all the soil though an old bed frame before making the bricks was pretty bad, and making the bricks in the cold and wet. I didn't like having to work on top of the roof either. Her paid work took approximately 24 - 30 hours per week and she built on her days off. "Initially I lived in a caravan at the caravan park so on my days off I would go to the block straight after breakfast and work all day." 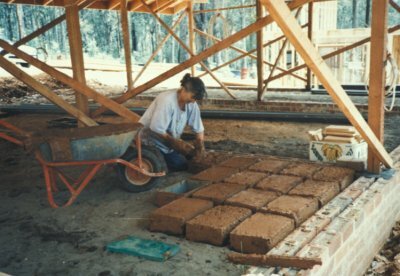 On an average day Pam made up mud bricks from previous day's mix approx. 40 - 50 per day then sieved soil and mixed another batch of soil for the next day. Most of the days she worked alone. "Work began at 8:30 am and continued until dark. When the frame and roof were up I installed temporary lighting and stayed until 10:00 or 11:00 pm."